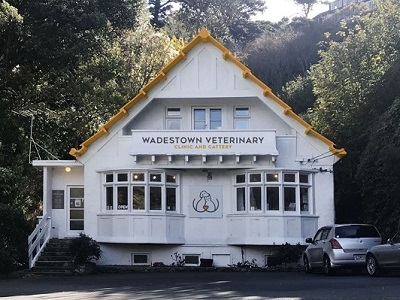 Wadestown Veterinary Clinic was established more than 50 years ago, and some of our clients have been coming here since it first opened. Mike Scully has owned and operated the clinic for almost 25 years, providing a relaxed and friendly environment for veterinary care. Sebastian is our well recognised resident cat. He can generally be found on the reception desk waiting for pats and tickles, or trying out our range of cat and dog beds in the shop. Life before Wadestown Vet Clinic, Wellington. Sebastian was rescued by the good people at the Wellington S.P.C.A. He had been found wandering the streets in Hataitai where they assume he had been dumped. Hungry and all alone, he was taken back to the Newtown Shelter where he spent the best part of 2 years. Eventually he was taken home by one of our clients which is where he remained for the next 3 months. Unfortunately the elderly gentleman that had taken him on had a fall breaking his hip and leaving him unable to return home. His family were unable to take him and they were very concerned that he go to a loving home and asked if we could house him in our cattery until one was found. Well after 2 weeks of him staying with us, he had won us all over with his quirky habits and extremely laid back nature. And we all agreed he would be the perfect addition to the Wadestown Vet Clinic, Wellington. So here he shall remain to live out his days.